Many investors know that income should play an important role in their investment portfolio, but most have no idea how to go about lining it up. So, they go without, or worse, pay too much, which essentially amounts to the same thing. Pay as little as possible for as much income as possible. Let’s start with how you define the term. Income investing is what you do when you assemble a portfolio of investments with the goal of maximizing the passive income they kick off. Investors typically do this for all sorts of reasons. Some want to spend the cash they receive (via dividends, interest, or rent) on things they can buy today. Examples include college tuition, groceries, their mortgage, charity, medicine, or other life events. My preference, however, is always to see as much of that income reinvested for as long as you can. That way you can build wealth faster and more consistently by making your money work for you instead of you working for it. This is especially true when it comes to investments that are constantly growing the income they kick off. That’s because you can ultimately receive more in income than you originally paid to make the investment. [VIDEO] What You Need to Know If Tax Reform Passes… Watch Here. Buy the right stock, for example, and you could literally own it “for free” over time. The difference this can make when it comes to the financial future of your dreams is positively jaw-dropping. Take one of my favorite companies, for example. 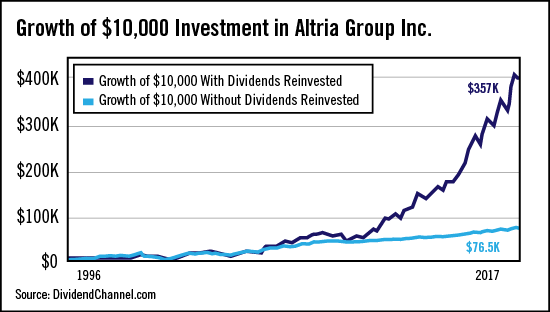 Had you invested $10,000 in Altria Group Inc. (NYSE:MO) on August 1, 1995, and left that money alone until the close of trading yesterday, your return would be a staggering 664.15%, adjusted for dividends and stock splits. But with dividends reinvested in this tobacco behemoth, your stake would be worth a whopping $356,535.05 versus just $76,486.04 had you merely owned the stock but not reinvested the dividends. You don’t want to pay too much. It doesn’t matter whether you’re talking about stocks, bonds, exchange-traded funds or any other investment. If you pay too much for something, you’re gonna earn less on it over time. Imagine buying a home for $100,000 in cash that you’re going to rent out to a friend for $1,000 a month or $12,000 a year. That’s a 12% yield on your investment. [($12,000/$100,000)*100] = 12%. Now imagine buying that same home for $500,000 but renting it out for the same $1,000 a month. Your yield would drop to only 2.4%. And, effectively, you’d leave an extra $161,160.29 on the table if you owned it for 20 years merely by having paid too much. And that’s where “YARP” comes in. The bull market is now a phenomenal 3,125 days old and most stocks are expensive, which means the risk that you’ll pay too much for the income you deserve is very real. Success comes down to how you define “reasonable” – the “R” in YARP. I start by looking at three measures. A company tapped into one or more of the six Unstoppable Trends we follow because it means there are trillions of dollars and the promise of healthy growth ahead. A PEG ratio of 1 or less because that suggests an undervalued investment. My goal is to find a high-quality business with a proven track record, savvy management, and plenty of profit potential. As usual, I’ll prioritize businesses that provide “must-have” products and services people need even when the markets panic or a recession rears its ugly head. …price is what you pay but value is what you get. Consider Zurich-based, ABB Ltd. (NYSE:ABB). The company has been a Global Fortune 500 company for 23 years and is firmly aligned with three Unstoppable Trends: Demographics, Energy, and Scarcity/Allocation. That makes it a logical choice for the $3.2-$5 trillion that will be spent worldwide over the next nine years on new and aging power grids. ABB is presently the world’s #2 electrification company which means, in keeping with the criteria I just shared with you, that it’s also an industry leader. I think it’s notable that the ABB considers itself a “technology leader” rather than an industrial supplier. It’s a subtle distinction most investors miss but an important one to my way of thinking because it tells you a lot about where management is headed at a time when the world is pivoting irreversibly towards bits and bytes. Not many investors realize this, but more than 55% of ABB’s sales are already from software and digitally enabled devices. And that’s on top of the 70 million connected devices and 70,000 digital control systems it’s connected – all of which help utilities and customers efficiency transmit and consume energy. Last but not least, the company is trading at around $24.68 a share with a PEG ratio of just .6789, which implies that the company is undervalued. That’s saying something considering the yield is an impressive 3.09%. Now, members of my premium investment research service, the Money Map Report, have been familiar with ABB for some time now. It’s one of the longtime favorites in the portfolio and has given subscribers the chance to pocket peak windfalls of up to 129%, 149%… and counting. My next recommendation will be hitting Money Map Report inboxes in just a matter of days, so it’s not too late for you to join the family.